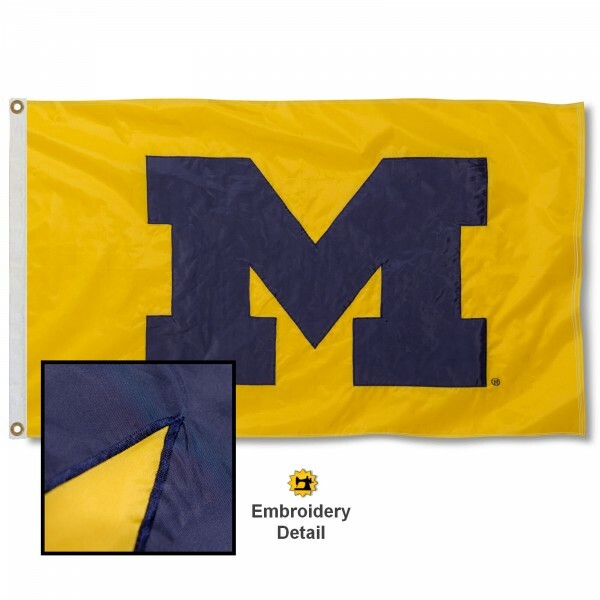 Our Michigan Wolverines Appliqued Sewn Nylon Maize Flag is made of 100% nylon, measures 3'x5', has quadruple stitched fly-ends, and has a side header with two metal grommets to attach to your flagpole or tailgate flagpole. The university logos are applied by sewing an appliqued and embroidered patch to each side of the nylon flag. This exclusive "2-patch" application provides a stronger and more durable flag than standard 1 patch methods. Fly your Michigan Wolverines Appliqued Sewn Nylon Maize Flag with any of our tailgate flagpoles or fly as a house flag with a 6' aluminum flagpole and adjustable flag bracket.